Target has the Disney Princess Sparkling Styles Dolls 7 pack on sale for $39.99 (regularly $64.99). 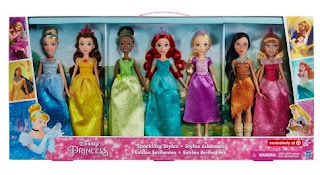 This collection includes Disney's Belle, Ariel, Aurora, Rapunzel, Cinderella, Pocahontas, and Tiana, all in sparkling styles. Each doll in the set comes dressed in their beautiful, movie-inspired outfit, with signature accessories to complement their look. Great for girls of all ages. 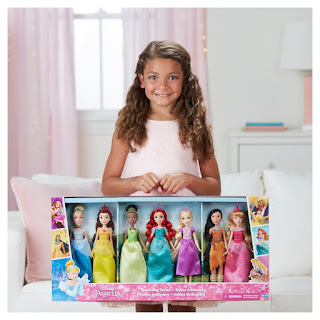 The clothes and accessories are interchangeable.